I’ve never been as entranced of Clark Gable as I’m evidently supposed to be. I don’t mind Gable in general, but I don’t specifically seek his movies out. I’ve got nothing against him, but I’ll sit down to a weak Cary Grant or John Garfield movie in a heartbeat. With Gable I’m somehow less impressed with his onscreen persona. This is probably the reason it’s taken me this long to get to Teacher’s Pet, which I watched today when I finally realized that NetFlix has it streaming but doesn’t have it on disc. What I expected was a creepy rom-com featuring a Clark Gable nearing 60 trying to woo a mid-30s Doris Day. Fortunately, that’s not really what we get here. James Gannon (Clark Gable) is a hard-bitten newspaper city editor in New York who is convinced that the only way to learn the trade of a reporter is to start at the bottom, get a few swift kicks in the backside, and learn the ropes the hard way, through work and practice. Therefore, he’s not even amused when he is contacted by a local college and asked to come as a guest to a journalism class. He responds with a rude letter and is then upbraided by his boss. It turns out the paper’s publisher is a big fan of this local college, having received an honorary degree from them. Gannon, thus, is forced to go and eat a little crow. This is despite his discovery that the professor for this class is (gasp) a woman. That woman turns out to be Erica Stone (Doris Day), daughter of a legendary Pulitzer-winning journalist. Before Jim Gannon can let her know who he is and that he has shown up, she reads his letter out to the class and dresses him down completely. Jim is naturally upset by this and broods for a full day or so before he hits on what he things will be an interesting plan. He’ll go back to the class under a fake name and demonstrate that his experience has led him to know more about the field of journalism than she does, and thus that the very idea of learning journalism in a college class is bunk. Adopting the name Jim Gallagher, he begins attending class. And, thanks to his years of experience, he’s a model student. And this is where the pseudo love triangle shows up. Jim is clearly attracted to his young, pretty teacher and she is clearly impressed with his obvious skill at the typewriter. Into the mix comes Dr. Hugo Pine (Gig Young), a psychologist at the same university who appears to be interested in Erica and also appears to have a head start. He’s vastly accomplished, written more than a dozen books, and speaks multiple languages. He’s also writing a book with Erica about the career of her father. Jim is not really able to get rid of this minor obsession with Erica despite having a casual girlfriend in nightclub singer Peggy DeFore (Mamie Van Doren). Eventually, of course, she’s going to find out about the deception. And, with no one else to turn to, Jim is eventually going to have to get advice from Dr. Hugo Pine on what to do. This, honestly, is kind of what I was dreading. 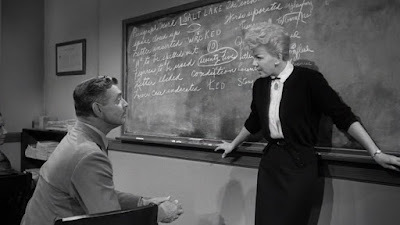 When this film was made, Clark Gable was pushing 60 and Doris Day was about 35. Allegedly the film was made in black-and-white to help hide this massive age difference, and it completely doesn’t work. Here’s what works, though: the film doesn’t really follow that path to where it normally would in such a movie. There is clearly some level of attraction between Jim and Erica, but aside from a kiss or two, most of which Erica objects to, there’s not a lot going on here beyond that simple attraction. What’s a lot more interesting is that both Jim and Erica figure out that the other one has some real insight in what it takes to make a good newspaper. Erica is all integrity, convinced of the importance of her father in the journalism world and of the ideals that he claimed to uphold. Jim is a great deal more practical, understanding that, like it or not, the newspaper survives entirely by advertising, which means that while Erica’s ideals are still important, how she thinks a newspaper should publish a story is often the sort of thing that would drive the paper into bankruptcy. Because of this, Teacher’s Pet is a hell of a lot smarter than I would have thought going in. It manages to be entertaining and amusing without being really funny. There aren’t a lot of laugh out loud moments here, but there’s a great deal of sweetness. It’s charming for lack of a better word, and develops the characters extremely well. That we get two characters who are capable of significant change in their positions by the end of the film, and that the film doesn’t give us a “the woman is always right” or “the woman should give up her career to be a wife” story is a massive plus. Both of these characters care passionately about the journalism business, and both of them care enough about it to change their minds when someone else makes a good point. That’s incredibly important and refreshing. I liked this more than I thought I would. Part of that comes from Doris Day, who is given something to do here more than just be pretty and perky. But a lot of it comes from the nominated screenplay, which is far more intelligent and interesting than a movie billing itself as a flighty rom-com has any right to be. Why to watch Teacher’s Pet: It’s not the movie you think it is in a good way. Why not to watch: At some point, the whole May/December thing really doesn’t work. "Erica is all integrity, convinced of the importance of her father in the journalism world and of the ideals that he claimed to uphold. Jim is a great deal more practical, understanding that, like it or not, the newspaper survives entirely by advertising, which means that while Erica’s ideals are still important, how she thinks a newspaper should publish a story is often the sort of thing that would drive the paper into bankruptcy." This sounds a lot like the businessman/prof conflict in Rodney Dangerfield's "Back to School." That's an apt comparison. The difference here is that she actually understands that he has a point, and is willing to change how she ends up teaching her students. At the same time, Jim realizes that her point that point that newspapers should try to answer the why question when radio and television can break stories faster is one that he never considered and eventually comes to believe. It's a nice realization on both of their parts. Back to School is funnier in this respect, but this turns out to be a lot more interesting. I love Doris Day so much! I frequently find myself wishing her movies were as good as she was. My favorite Doris Day movie is Calamity Jane! I saw Midnight Lace fairly recently and I didn't much like the ending but I loved it up to the last 15 minutes or so. And then there's That Touch of Mink, which is so dumb it should be irredeemable but I find it highly entertaining for all the wrong reasons. I've never seen Teacher's Pet but I might give it a try eventually. I'm not such a big fan of Gable but I love his 1930s movies pretty much across the board (my favorite Gable movie is Night Nurse) and I love The Misfits. I watched Night Nurse a couple of months ago--it's pretty wacky (and Gable plays a mustache-less villain) and a lot of fun for a pre-code proto-noir. Barbara Stanwyck and Joan Blondell walking around in their lingerie is just an added bonus. Teacher's Pet is worth your two hours. It's maybe a touch long, but the story is genuinely good, and Doris Day is worth seeing in it. I love Gable. He was not an actor of great depth but he exuded star charisma and a distinctly brash masculinity like no one else. And within his comfort zone, for such a man’s man comedy came very easily to him, he could be both affecting and fascinating. I likewise will watch most any Cary Grant and ANY John Garfield movie at a moment’s notice but except for the odious Parnell that holds true for most of Gable’s films as well. It’s been a while since I’ve watched this particular film but I do remember it being smarter and more complex than I had expected. It helped that both Doris and Gable were playing people of obvious intelligence who grudgingly respected each other’s smarts even if they were foreign to their way of thinking. However when I think on it the performer I recall the most clearly is Gig Young, at the top of his game in the context of the suave snook who usually gets left holding the bag. You’ve convinced me that I really must give this another look and reacquaint myself with it. I think you'll appreciate it if you do catch up with it again. It's fun, but it's really smart, and that's what makes it worth seeing. That there's romance here is expected. That the relationship ends up being based on mutual respect is actually quite surprising in the best way possible.